While Mother Nature deemed that it would be sunny and dry on my day at Jerez, a hefty amount of Bridgestone’s efforts regarding the S22 were directed towards wet weather performance. The primary change in the S22 is an increase in the sea/land ratio of the tire tread, meaning larger voids (grooves) in the tread to channel away more water. 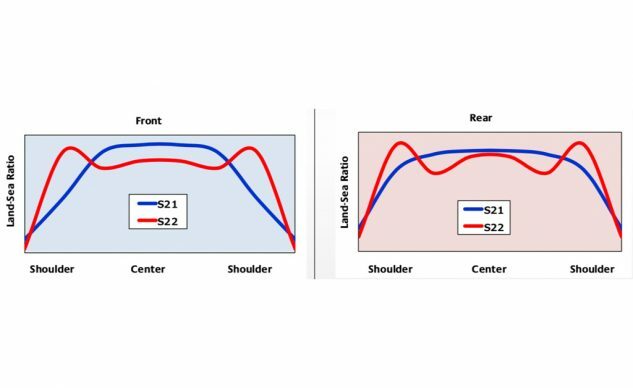 The groove position and angle on the tread relative to rotation also assists in this role, with the majority of this change coming in the shoulder of the tread, which is associated with cornering. Often when the amount of grooving is increased in a tire, a penalty is paid in longevity, as the groove edges tend to flex and increase wear. 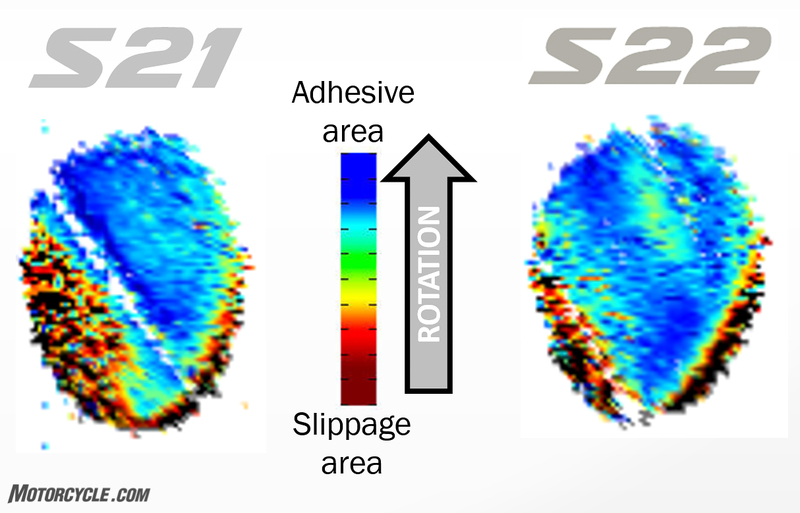 According to Bridgestone, the S22 utilizes a special 3D groove edge shape for optimal rigidity to combat this tendency. Still, we’ll just have to take Bridgestone’s word on all of that since I only had a day’s ride on the track. Note how the percentage of grooving increases in the S22 when the bike is leaned over. Bridgestone’s goals for the S22 in the dry could be best described as “more is more.” Bridgestone wanted more quickness in steering, more feel, and more grip without compromising longevity. The front tire receives two compounds in three zones, while the rear gets three compounds in five zones. For the rear tire, the center compound’s silica provides the grip and the wear resistance, and to get more silica in contact with the road, the size of the silica molecules was reduced. 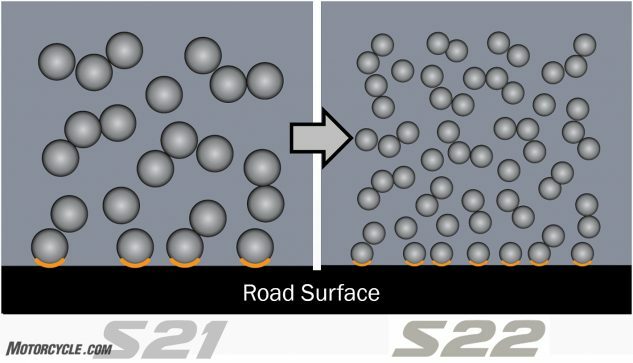 By shrinking their size, more silica molecules could actually fit into the same surface area, for a claimed 25% bump in contact with the pavement. 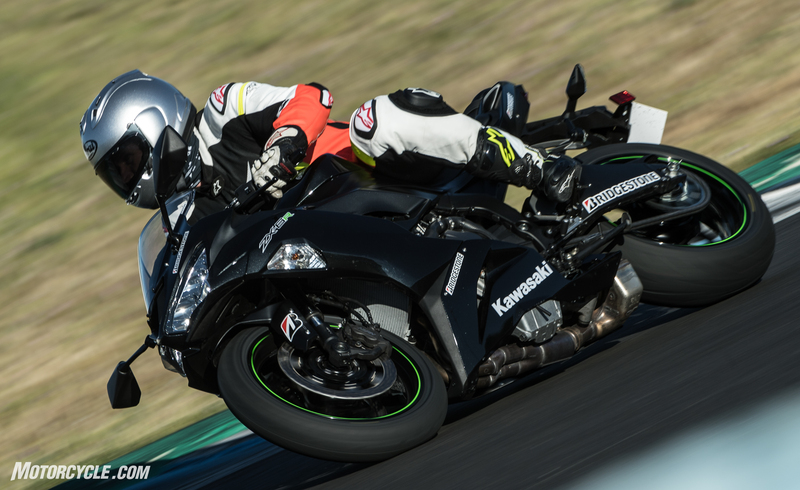 The sides get two different traction compounds for when the bike is leaned over with the outer one – the one without the grooves – being the stickiest. 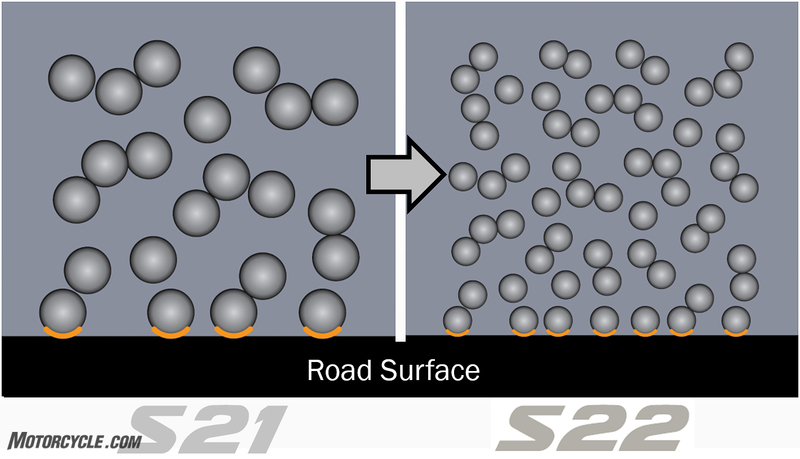 One of Bridgestone’s goals with the S22 was to increase the contact patch size and decrease the slippage area at the edge of the contact patch. Utilizing Bridgestone’s ULTIMAT EYE technology, a proprietary tire dyno that allows engineers to measure contact patch grip and slippage in a controllable/repeatable manner, the designers were able to test a wide variety of compounds and profiles. Through this testing, the slippage at the back edge of both front and rear contact patches was reduced. 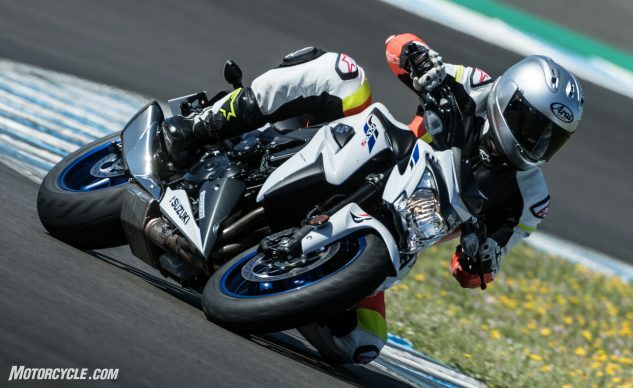 The payoff for this effort is increased cornering grip and lessened tire wear – a result that Bridgestone claims to work better in all riding conditions. The slippage area is denoted with the dark colors. Note how it lessens on the S22. Starting our day in 46° F temperatures – and with no tire warmers – illustrated how quickly the S22s can get up to temperature. With the initial lap being the first time I’d ever turned a wheel at Jerez, there was little danger of me pushing the tires beyond their cold temperature level of grip, but by my third lap, my familiarity with the track layout and my confidence in the S22’s grip had my knee skimming the pavement with nary a squirm nor a wiggle. 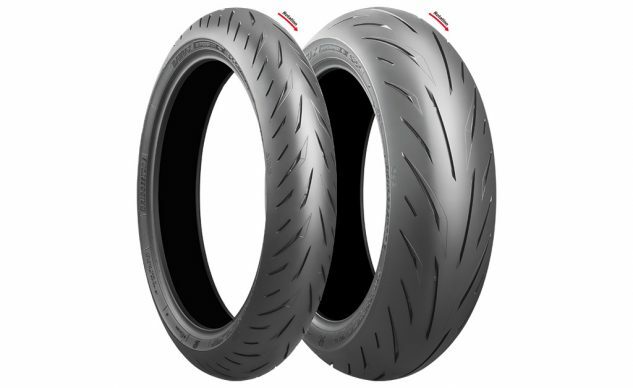 Bridgestone’s S21 tires have a reputation for providing good grip in a wide variety of riding conditions but with steering that was a bit slower than their competitors’ comparable models (think Dunlop Q3+, Michelin Power RS, and Pirelli Diablo Supercorsa SP). The S22 was designed to remedy this problem. 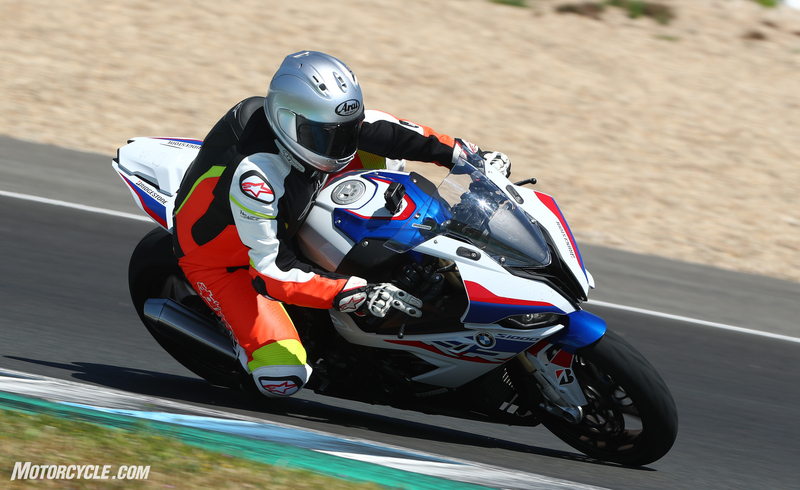 From the moment I got up to speed on any of the four bikes (BMW S1000RR, Kawasaki ZX-6R, KTM 1290 Super Duke R, and Suzuki GSX-S1000) I rode over the course of the day, the steering was quick and precise – whether on the brakes or off. Although Bridgestone claims a 15% increase in cornering speed thanks to the improved grip of the S22s, I can only say that there was grip aplenty, and when the tires did decide to slide a bit, it was predictable. 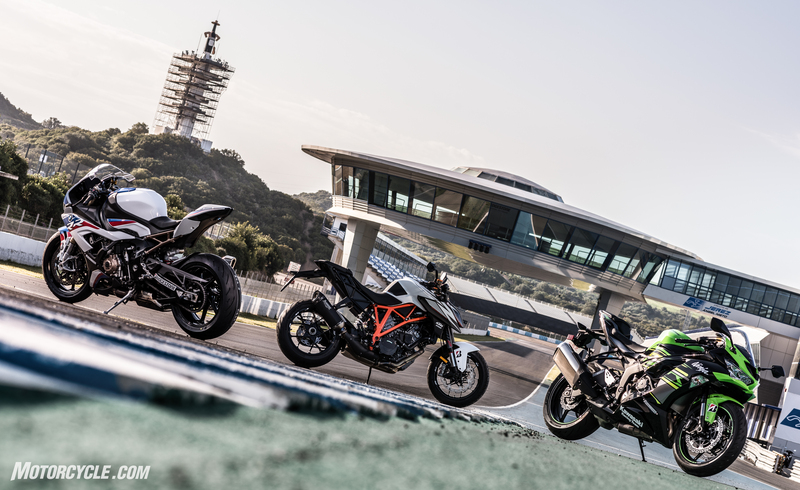 When it comes to putting down the power of today’s hyperbikes, the S22 will spin up quicker than a track-focused tire, but it is street rubber, after all. This increase in steering quickness didn’t come at the expense of the S22’s stability under acceleration. Being street tires on 1000cc (or larger) sportbikes, it was easy to get the rear tire to request the intervention of rider aids – if that’s the way you ride. Of course, by the end of the day, with approximately six hours of track time under their belts, even riders like myself, who prefer to be gentler on their throttle inputs, could feel the bacon-saving efforts of the traction control. These are street tires, after all. 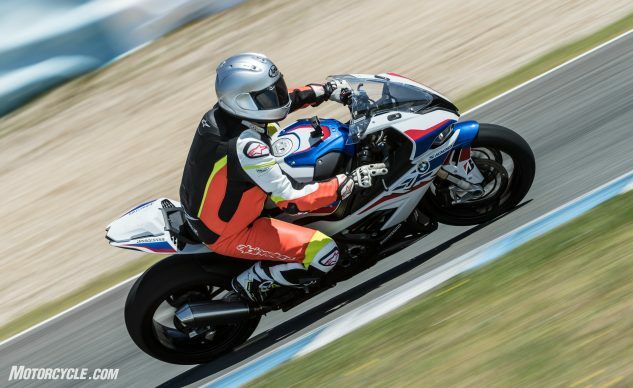 In fact, if you’re an aggressive track day rider, I’d recommend something designed explicitly for track use. That said, for the average quick rider, say slow A group or fast B group rider, the S22 will work fine in the closed course environment. On the street, given the quick warm-up time I experienced on the S22s, I think most sport riders will be quite comfortable with the cornering abilities provided by the tires. My time at Jerez certainly made me aware of how much extra grip they’d have left in their quiver on a street ride. I know that I’d love to mount a set on my Yamaha R6 for some SoCal canyon duty. Maybe I’d even get to ride them in the wet. 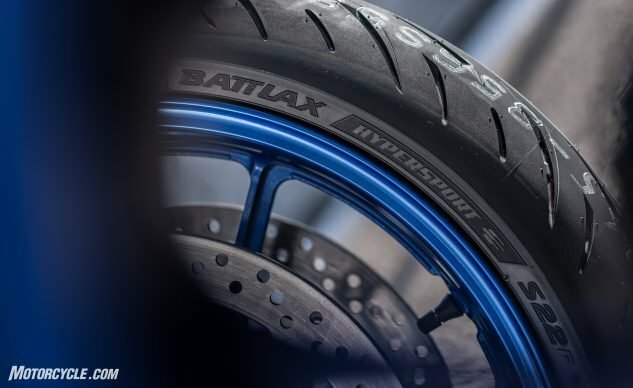 Bridgestone Battlax S22 tires have been in dealerships since January in most popular sportbike sizes, and the lightweight class will see the introduction of S22s in 2020. The fronts retail for $211, and the rear costs $220 – $305. 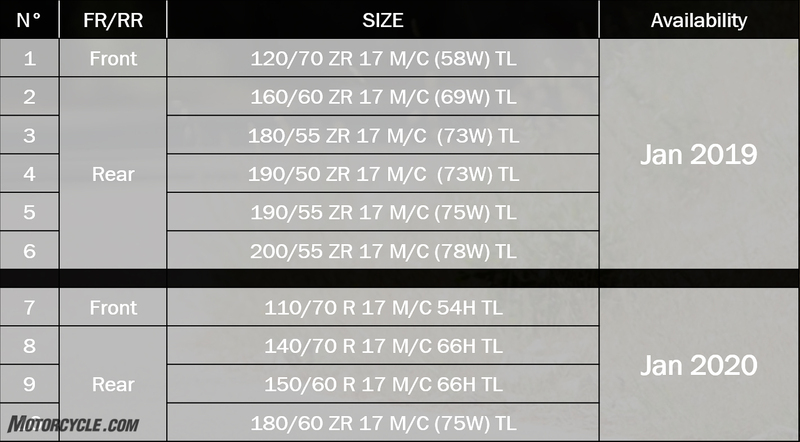 Here are the tire sizes and their availability dates.